Scharman Propane Gas Service, Inc. 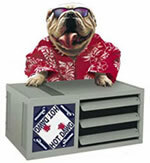 The Hot-Dawg Heater, from Modine, is one of our most popular models. It is easy to install, takes up a very small space, and puts out a lot of heat for its size. Additionally, the top or bottom clearance to combustible material is only one inch. That means, you can mount the Hot-Dawg heater directly to your sheetrocked ceiling, with only 1" of clearance. The Hot-Dawg heater is vented with a power-vent. A fan forces exhaust fumes outdoors, so there will be no burned gasses inside the building. However, the unit does draw air from inside the building for combustion. So if you paint frequently your garage, use chemicals, cut wood, or anything that leaves airborne particles, we suggest you look at one of our sealed combustion heaters instead. © Scharmane Propane Gas Service, Inc. Web Design by 4am Media.com.